By complete accident I ran across a great collection of 30 Things You Wish Could Make a Comeback on AOL.com this morning. Amongst things to be expected in 2008 like cheap gas and old fashioned MTV (you know, when they actually showed music videos 24/7) we were delighted to see that nylon stockings made the list. Now, we at StockinGirl already know that nylon stockings are back and have been for a while. So with one of those 30 items checked off - which should comeback next? My favorites from the list are rotary phones, drive-in movie theaters, coke in glass bottles, CBS Radio Mystery Theater, and big wheels. See all 30 items here. We had a pleasant surprise this morning when reading the usual fashion blogs- our Isabel Wool Tights can be seen on the fabulous Trend de la Creme blog amongst other creative, beautiful tights. Over the Knee Socks - All over Glastonbury! 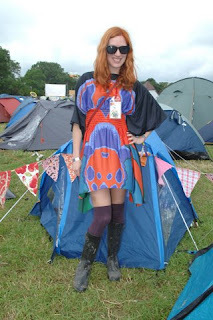 Style.com has a great slide show of looks from the Glastonbury music festival and I noticed a lot of over the knee socks! Take a look below and then see all the looks here. Do you wear over the knee socks? Do you layer them with tights like above? Tell us how you wear socks in the comments! Though I'm not sure about the over-sized t-shirt and bike shorts, I love the bright tights combined with fantastic shoes. A perfect example of how open-toed shoes can work with tights. Image from: Just Glitter Lust. I'd wear them with a simple black dress.